In the late 1930s, Walt Disney had an idea for an experimental film that was unlike anything he or anyone else had ever done. With the dream of combining classical musical and animation into one grand "concert feature," Disney worked on getting the rights to the story of The Sorcerer's Apprentice, and then he started to build a team to help bring his unconventional film to life. Fantasia released in select theaters in 1940, and now over 75 years later, it is still regarded as his masterpiece and one of the most important and ambitious animated features of all time. Here are 10 things that you probably didn't know about the film that revolutionized the animation industry. 1. IT WAS THE FIRST FILM TO USE STEREOPHONIC SOUND. The scope and soundstage of Fantasia were too grand for the standard theater setup of 1940, but instead of making a film that worked within the limitations of the technology, Disney and his team had to develop a way to upgrade theaters to match the concert experience of the film. According to A.P. Peck of Scientific American, a dozen or so theaters across the country had to upgrade their equipment to show Fantasia in what was called “Fantasound.” This involved installing more speakers around the room instead of the few that were typically placed behind the screen (the installation at the Broadway Theater in New York included 90 speakers), as well as new projectors and sound reproduction machines. The estimated cost for the upgrades was around $85,000 per theater, which is close to $1.5 million today when adjusted for inflation. 2. IT IS DISNEY’S LONGEST ANIMATED FEATURE. For its general release and past restorations, Fantasia was cut to reduce its running time, but at two hours and six minutes, the film is still the longest animated feature the studio has ever made. It would have been even longer, but a ninth segment, Claire de Lune, was nixed during production. The segment was later re-scored and included in the comedy musical Make Mine Music. 3. WALT WANTED IT TO BE A 4D EXPERIENCE. Transcendent sound was not the only idea that Disney had for his concert feature. Having assembled a classical music super squad helmed by Leopold Stokowski, Disney’s imagination was moving at full tilt. Technical suggestions that he contributed to the planning phase included ways to “stimulate the audience’s senses,” according to Disney historian Didier Ghez. Disney thought it would be a good idea to have fans blow perfume into the theater during The Nutcracker Suite, he wanted the smell of gunpowder to fill the room during The Sorcerer’s Apprentice, and he and Stokowski both liked the idea of having a portion of the concert shown using 3D projection, which was limited to black-and-white imagery at the time. 4. IT WAS A COMMERCIAL FAILURE AT FIRST. Fantasia is regarded as one of the highest grossing films of all time (when adjusted for inflation) with over $83 million at the box office, but it did not open to huge numbers. Because of the special equipment needed to show the film, the theatrical release was very small, as were the sales. What helped the film was its longevity. Fantasia ran for 49 consecutive weeks in New York and nearly as long in Los Angeles, which set an all-time record back in 1941. It also returned to theaters several times over the course of 50 years. The disappointing initial performance and the onset of World War II killed Disney’s dream of creating a sequel, which he had already starting planning for in his head. 5. IT CHANGED THE WAY MICKEY MOUSE WAS DRAWN. Walt Disney created Mickey Mouse back in 1928. 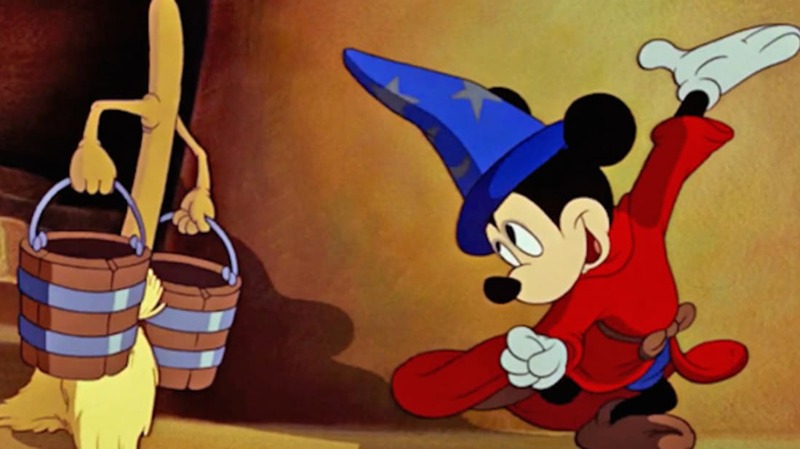 The character did evolve over the years from his first official appearance in Steamboat Willie, but Fantasia marked a pretty major change by artist Fred Moore. One of the adjustments that Moore made to the design of the character was to give him pupils for the first time, instead of the black ovals that once stood for his eyes. Moore is also credited with shortening Mickey’s nose and giving him his now-signature white gloves. 6. STOKOWSKI DIDN’T THINK THE MOUSE SHOULD BE THE LEAD. Stokowski continued by suggesting that a new character would contribute to the “worldwide popularity” of the film. His argument made sense, because the Mickey of the late 1930s was not the dominant force that he is today, but Disney obviously did not agree. Dopey (one of the Seven Dwarfs) was also considered for the part, but Disney didn’t like that idea either. 7. THE SORCERER CHARACTER WAS INSPIRED BY DISNEY HIMSELF. According to Oh My Disney, the official Disney news and quiz site, silent film star Nigel De Brulier was the live model used when designing the sorcerer character for The Sorcerer’s Apprentice, but Disney was the inspiration. The team gave the character Walt’s signature eyebrow raise and named him Yen Sid, which is Disney spelled backwards. 8. PEOPLE WERE USED AS LIVE-ACTION REFERENCES. 9. A CONTROVERSIAL CHARACTER WAS CUT FROM HOME VIDEO RELEASES. The Disney company’s history is peppered with problematic depictions, and unfortunately the highly regarded Fantasia was no exception. The fifth segment of the film, called The Pastoral Symphony, features elements of Greek mythology. Among the centaurs and satyrs was a character known as Sunflower, a racist depiction of a Black girl in centaur form with big lips, dark skin, and hoop earrings. Sunflower was shown shining the hooves of the other centaurs and performing other subservient tasks. The character was later censored from prints of the film in the 1960s. 10. THE RESTORATION TOOK TWO YEARS TO COMPLETE.